The next upcoming Mardi Gras is on Tuesday February 25th, 2020. 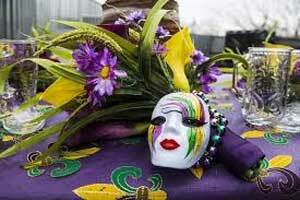 Mardi Gras known as Shrove Tuesday or Fat Tuesday falls annually on the day before Ash Wednesday (start of Lent). The word "Mardi Gras" means "Fat Tuesday" in the french language. Celebrations include festivals, parades, dancing and feasting before the fasting starting on Ash Wednesday.. This is a Christian celebration beginning after Epiphany which is the Three Kings Day and finishing on the day before Ash Wednesday where people fast. Mardi Gras celebrations have a carnival like atmosphere where people dance, have parades wear masks and costumes and indulge in feasting and drinking. In the United States, New Orleans has one of the largest celebrations with a parade and other festivities. Mardi Gras is is celebrated as a Christian tradition world wide important in the Anglican and Catholic nations. The tradition dates back thousands of years ago to pagan and roman spring festivals. When Christianity arrived in Rome the leaders decided to incorporate some of their spring festivals into the Christian traditions and as a result the excess's and debauchery of Mardi Gras prior to Ash Wednesday (Start of Lent) came about.